Your Ultimate Canada Packing List Written By A Canadian! If you are wondering what to pack for Canada, you are not alone! Planning a Canada trip can be super exciting – but packing can be difficult. This is because Canada is a massive country with very differing climate regions. To make this more difficult, the different regions have different weather even though the month might be the exact same. Winter in Vancouver sure is different than winter in Toronto or Montreal! Lisa learned this first hand when she moved to Canada. She arrived in the summer time in Ontario (very hot) and stayed until the winter (very cold and snowy)! She’ll be the first to tell you that it was hard to pack for those seasons all in one go. 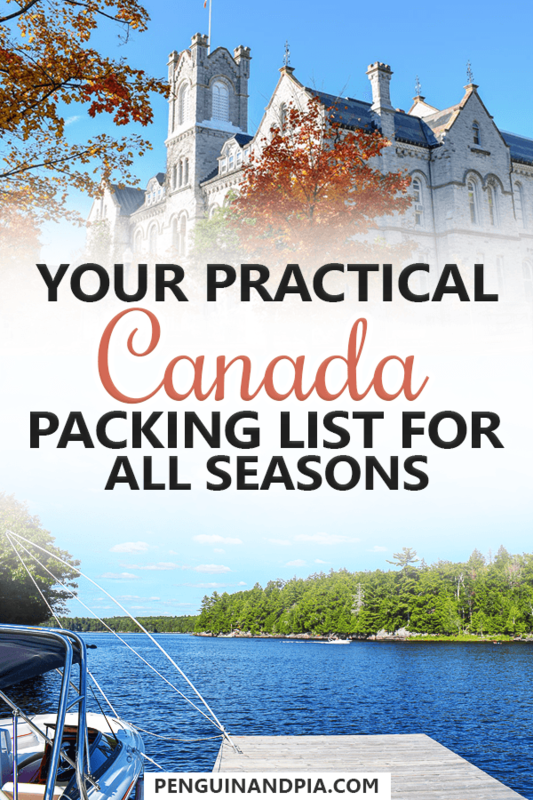 So, to help you figure out what Canada essentials items need to be on your packing list for Canada, you’ve got a born and raised Canadian here at P&P. Whether you are just visiting, studying abroad, or moving here for good, here’s what you should pack for Canada for each season and region. Also, remember: If you hold an EU passport, you will need an electronic travel authorization (eTA) to enter Canada – lots of other passports also require this. We would recommend that you apply for your eTA on the official government website. There are third party providers but often times they charge a ridiculously high feee. It should cost you 7 CAD to apply for an eTA, not 50. Below, we dive a bit more into the kinds of luggage and why you would bring them (or not) if you are packing for Canada. Keep in mind that these are general guidelines that mostly follow common sense but ultimately you do what you have to do to travel comfortably and in your own way! If you are travelling to Canada for a city (hopping) vacation, then a traditional suitcase or wheeled luggage might do. If you are just visiting Toronto, Vancouver, Montreal, etc and only going from the airport to a hotel and back again, a simple wheeled luggage is the way to go in the spring, summer, and fall seasons. Don’t expect to be able to wheel your luggage through the snowy sidewalks in major cities like Montreal or Quebec City in the winter. Lisa has a smaller suitcase with four wheels that she has had for years and really likes since it is the perfect size for airline weight restrictions. She has also brought it to Canada when moving there for a few months. Unfortunately, the exact model does not seem to be available anymore, but this suitcase is very similar to hers. If you plan on camping, hiking, or generally being more rough with your gear, then a soft backpack or duffel bag might be more for you. There’s a good chance you know beforehand if you are city hopping or hiking around the Rocky Mountains in Alberta and British Columbia. If you are doing both, consider taking a backpack or duffel since a backpack can work in the city but a wheeled piece of luggage won’t be as convenient in the wilderness! We really love our larger backpacks for travel. Lisa has her classic Osprey Farpoint 40 that she loves while Eric has his MEC (Canadian company) backpack. The nice thing about our larger backpacks is that they are still small enough to take as carry-on luggage on most airlines. This means we don’t usually check a bag. We have a longer guide on finding a great travel backpack for you, if you are interested. Speaking of carry-on bags, another item you want to think about for Canada is your carry-on bag (if you are flying). Often, a backpack makes a great carry-on bag. A good carry-on backpack has double usage in Canada since it can also serve as a great day pack. Backpacks are good for both city hopping or for hiking – so keep that in mind when choosing your carry-on item. Our daypack that we love and use most of the time now is our Northface Borealis Backpack. It was originally Lisa’s but Eric has recently taken it over and used it as his carry-on backpack and also day pack for day trips. It’s awesome for holding work related things as well as clothing. If you considering also bringing a (Small) Purse/Handbag, then you might consider one like Lisa’s . She brings a small black cross-body bag on most of her trips that she uses when out in the city, meeting with friends, etc. It is easy to toss it into her larger backpack during flights since it doesn’t take up too much room. So far we have covered what kind of luggage you might bring over (based on season and activities). Now we can dive into the essential items that should be part of your Canada packing list – regardless of the season you are travelling in. We will cover the seasonal additions in the sections below that. How many items of the same category (e.g. underwear, socks,…) you are bringing depends on how long you are travelling for and whether you have a washing machine available. We usually never take more underwear and socks than for a week even when we are travelling for months on end. These items can always be hand-washed if they have to. When packing for your Canada adventure, you shouldn’t just think about clothes. There are some items and documents that are just as important (if not more important) than your clothing items. Valid Passport – When visiting Canada you have to make sure that you bring your valid passport. For people from the EU that are used to travelling around the Schengen area with their ID cards – this will not suffice for Canada. You need a passport. eTA – As mentioned above, lots of citizenships require an eTA when entering Canada by air. You can check here whether you need an eTA or a visa to enter Canada. Proof of Insurance – When visiting Canada you should make sure to take out foreign health insurance or travel insurance to make sure that you are covered in case of emergencies. If you have a blue EU health insurance card it won’t be enough. Eric has used WorldNomads before and Lisa has tried TrueTraveller. We had good experiences with both. Bank Card(s) – We don’t usually get a foreign currency before we arrive in the country. Taking out the money directly from an ATM gives us a much better exchange rate. Lisa has a card from her German bank DKB that doesn’t have any fees when using it abroad. Make sure to bring a similar card and/or a credit card since lots of purchases can be paid with Credit Card in Canada. Drivers License + International License (if renting a car) – If you are planning on renting a car, then you have to bring your drivers license and in some cases an international drivers license as well. You can request an international drivers license in your home country before you leave. To look for a great rental, you can start your search here. The essential clothing items on your Canada packing list are not really that different from any other packing list. In fact, most of these items you can also find on our Europe packing list. It’s below in the season-specific sections that we will dive into the differences you need to think about when it comes to clothing to pack. Pants – pants are important, but there are different types of pants you should bring. That is also determined by activity. Active Pants (like a yoga pant) are good for hiking and moving, as well as to put under other pants for warmth and for lounging around. Jeans are good for everyday exploring and can be worn out dressed up or down. They also don’t usually need ironing which is a big plus for some! Lisa loves her Levi 711 Jeans. If you plan on going to nice dinners and whatnot, a dress pant or chino isn’t a bad idea to bring along! We go into other types of pants in the seasonal sections. Shirts – like pants, shirts are important, too. The shirts/tops you bring are dictated by season/weather and activities. A combination of basic t-shirts and longer sleeve shirts are great for various temperatures. T-shirts are good for hot summer days while long sleeves are better for fighting off the bugs in the cool summer evenings. If you plan on going for nice drinks or dinners while city hopping, consider nicer dress shirts or tops. In general, pack so you can layer your clothing – meaning you can take layers off as the day warms up and put them back on as it cools down. Socks – lighter socks are always a good item to have. Season depending, the thickness might change. We will cover this below. Underwear – pretty standard item, you do you. Fleece Jacket – a fleece jacket is an item you should bring for any season. It can be an outer layer for long summer nights and cooler spring/fall days. In the winter it works great as a middle layer underneath your warm winter coat. The kinds of shoes you will be packing for Canada depends largely on which activities you plan on doing and on the season you are travelling in. We’d recommend that you bring a comfortable shoe or boot that is good for walking, hiking, etc. Lisa has a pair of Merrell hiking shoes that she loves. If you are travelling in the winter, a warmed boot is a must whereas a sneaker/running shoe is good for summer. Your toiletries won’t really change that much with the season. However, we do recommend that you buy sunscreen and/or bug repellent, if you are planning on spending time outside during the spring and summer months. Small Toiletries Bag – We like travelling with small toiletries bags since it means that we won’t be able to bring a whole bunch of unnecessary things that we won’t use anyway (for Lisa this means mainly make-up). Toothbrush + Toothpaste – Don’t forget to bring your toothbrush and remember that your toothpaste has to be under 100ml if you want to put it in your carry-on luggage. We like travelling with travel toothbrushes like these ones that fold int themselves. Face Cream (with SPF) – wearing a face cream with SPF is important even in the winter. When you spend a lot of time outside and the snow reflects the winter sun, you can actually harm your skin if you don’t protect it. Shampoo – make sure you bring shampoo and body wash if you don’t want to go out shopping once you arrive in Canada. Depending on the length of your trip, you should consider bringing travel sized bottles as this will save you space and weight in your suitcase. You can use small bottles like these. Deodorant – don’t forget to bring your deodorant if you like to use a special brand. You can always buy a deodorant once you arrive in Canada (at Shopper’s Drugmart for example), but they might not have your preferred style/brand – especially if you are European and like to use spray deodorants. Razor – if you shave regularly make sure to bring your razor. In case it is an electric razor, remember that you might have to bring an adapter for the plug as well. Hairbrush – Make sure you don’t forget your hairbrush. Lisa has a small travel sized hairbrush like this one which she has taken on all of her travels over the last 18 months. Make-up (if applicable) – If you wear make-up, make sure to bring what you need when travelling. Lisa always tries to only pack a minimal amount of make-up when travelling. In the summer it can get quite humid, so bringing a heavy liquid foundation might not be the best call. Medication (if applicable) – In case you have to take any medication regularly, make sure to bring enough so it lasts for the duration of your trip. If possible, bring the pills in the original packaging so it is easy for border security to find out what you are bringing into the country if they do end up checking your bag. Computer/Tablet + Charger – if you are travelling for work or just like having a tablet with you, be sure to bring your computer. Canada overall has Wifi so you don’t have to worry about not being connected. Phone + Charger – this one probably goes without saying, but a phone is an essential item these days. Google Maps is great for looking up where you are trying to get to in Canada – whether downtown Toronto or on a hiking trail (and you have cell service). E-reader + Charger – if you are a traveller who likes to read, you’ll know that books are pretty darn heavy. Lisa has a Kindle and she really likes it. It’s lightweight and holds a pretty good charge. Camera + Charger – we’re big into photography and taking photos on our travels. Canada is definitely a country worth photographing. The Rocky Mountains are absolutely stunning, as are the lakes in Ontario, as is the Coastline on the East Coast. Lisa has a Fujifilm X-T10 (a mirrorless camera) while Eric has a Nikon D3300 (a DSLR). We love them both. Sunglasses – these are an essential item for many seasons. The hot summer sunshine can be pretty bright BUT the sunshine in the winter is also very bright. In fact, it’s important to wear sunglasses in the winter when it’s super sunny since the sun reflecting up off the snow can cause a condition called “snow blindness”. You do NOT want snow blindness. Converter/Adapter – if you are coming from Europe to Canada, you will need an adapter to fit the North American-style “two flat prong” plus. We like this adapter since you can charge a bunch of USB-based charging products (phones, etc) at the same time! The voltage in North America is also different than in Europe but most electronics can work with both (double check the lable!). Memory Card – memory cards are important for storing memories… from both cameras and video cameras, if you use them. We trust SanDisk memory cards. Other kinds have created errors and we’ve lost photos before which was quite sad. Travel Pillow/Blanket – a travel blanket is a good item for the plane but it’s also good if you get cold while on a bus or just hanging out in your accommodation in the winter. It can also double as a picnic blanket in the summer sunshine! We have a whole post on the best lightweight travel blankets if you want. Snacks – usually we cut up vegetables and make sandwiches. That said, Canada can be pretty picky with bringing in fruit, vegetables, cheese, and other raw/uncooked items like meats, etc. So, either eat any perishables before you land OR just buy classic snacks like crackers, chips, etc. Got Loads of Cords? – Look into a Travel Cord Organizer. Seriously. Keep in mind that the seasons give you different climates depending on where you travel to. This is something we cover in our post on the best time of year to travel to Canada. For example, winter in Ontario can be quite cold and snowy but winter in Vancouver is more rainy like a maritime climate (such as in Scotland). Canada is a massive country so making generalizations about climate and weather is almost impossible! That’s why we are breaking down seasons below – and we’ll talk about what to pack for the different cities and provinces, too. Autumn (and spring) can be cooler but beautiful. Since spring and fall are generally the same climate, we’ve grouped them together here. 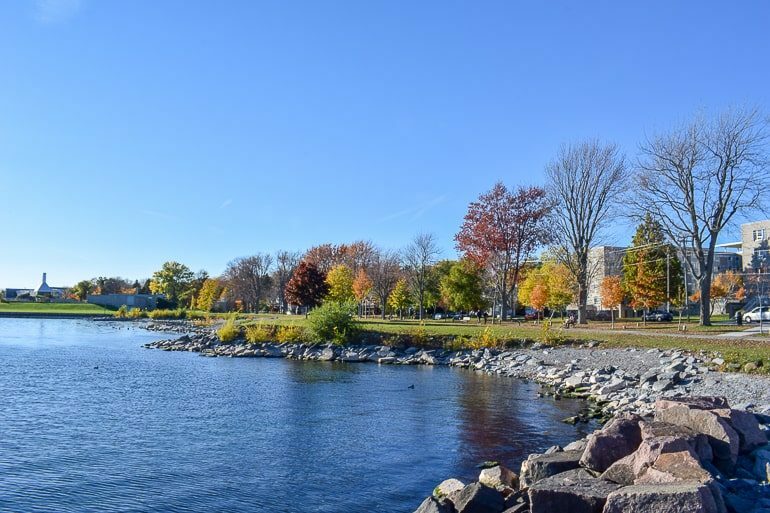 It’s going to be cooler for sure – with a winter thaw likely happening in the spring and cooler winds in the fall. A Waterproof/Resistant Jacket – having a good outer layer, like Eric’s Northface, is pretty important for these two seasons. A light, water-resistant jacket can act as a wind breaker on the East Coast or a rain guard in the rainy spring in Ontario. Waterproof Boot/Shoe – having a rubber boot might be a good idea foe the spring time since the melting snow can make the ground very damp. These kinds of boots also work well for hiking since they have a tread for taking on the mud AND they tend to be warmer which make them a good fall footwear choice, as well. Light Gloves – these seasons are where you could use those tech tip gloves we talked about. Having a fall glove just keeps the hands toasty warm without having to put on a massive winter glove. The summer in Ontario is prime bathing suit weather! Summer in Canada can be pretty hot – but this also depends on where you are. Summer in Ontario can get VERY hot while summer on the West Coast (Vancouver) can be cooler but still pleasant and not as humid as Ontario. 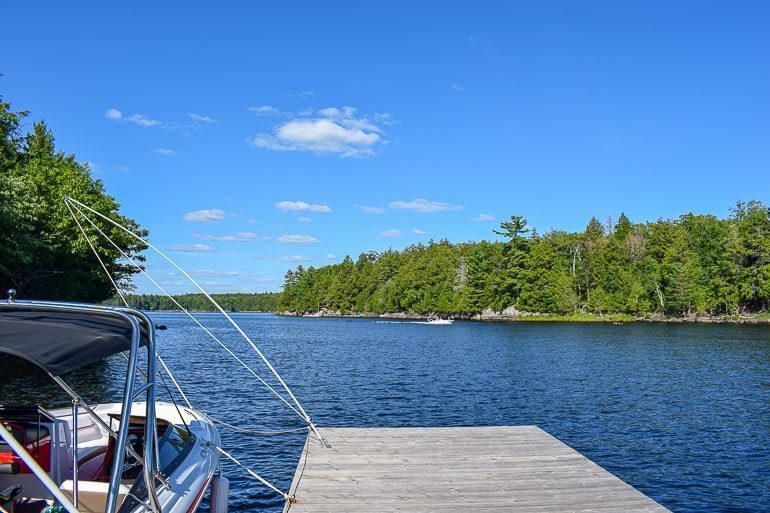 Knowing this can help you plan and pack for Canadian summers at the cottage or on the coast. Shorts – summer time heat is definitely a place for wearing shorts in Canada. If you are coming from Europe, there’s a chance you are used to wearing pants even when it’s hot. You still can do this, but summer humidity in parts of Canada (like Ontario) is awful in long pants and you will want shorts. Dresses – If you enjoy wearing dresses, bringing one or two to your trip to Canada is a fantastic idea. As mentioned above, the humidity in the summer can be bad so wearing dresses over pants can be a big relief. Bathing Suit – is definitely a summer essential item if you plan on doing any swimming. Canada has literally millions of lakes so there’s plenty of places to go in for a dip. Lighter Walking Shoes and Sandals – aside from a lighter shoe for walking or hiking, we’d recommend a good sandal. You can opt for a hiking-style sandal that is multi-purpose of just simple flip flops if you will be at the beach or cottage. Lisa has a pair of slip on Toms with a sturdy sole that she has worn a lot during the summer in Canada. Travel Towel – depending on where you are staying, a good travel towel can help you keep baggage weight down. These are also the best option for any summer excursion where you are out hiking, camping, or canoeing for a few days. Hiking/Camping Gear – if you have really good gear and you are planning on bringing it over then by all means. An example might be your hiking poles or your sleeping bag. That said, anything summer time outdoor gear (like a tent, etc) can be bought or rented once you are here. 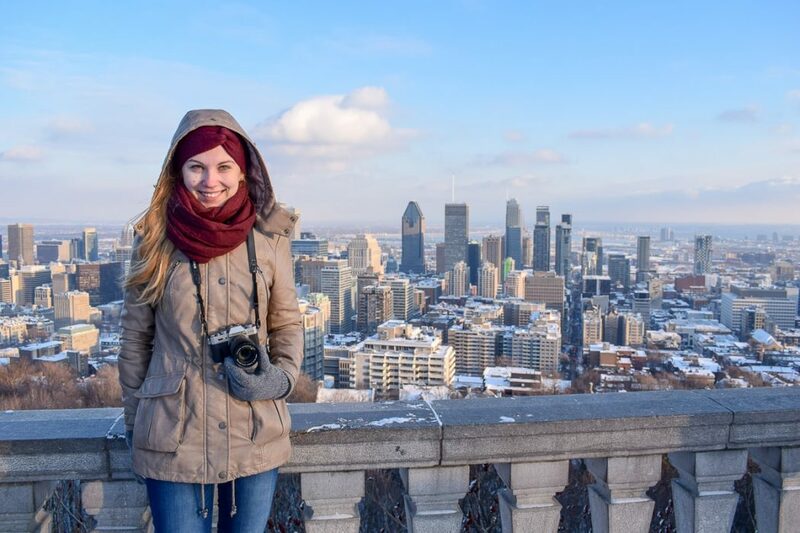 Lisa bundled up for the winter in Montreal! Warm Winter Boots – If you are visiting Ontario, Quebec, the Prairies, the Rocky Mountains or parts of Atlantic Canada, then you should really consider bringing some warm winter boots. Lisa has a pair of warm winter boots from the brand Tamaris that reach her shin and they have kept her feet warm and dry on all of our Canadian winter adventures. We couldn’t find them online anymore (they are a few years old), but these ones are pretty similar. Warm Winter Coat – Similar to the winter boots, you should bring a warm winter coat if you plan on visiting any of the colder regions. Last winter we had lots of days with temperatures at -10 °C (14 °F). During that time Lisa was glad that she has her Didriksons coat which keeps her nice and warm. We also couldn’t find the exact model online anymore (her jacket is a few years old), but this Didriksons coat looks very similar. Hat – also called a “toque” in Canada, a good warm winter hat (with a pom pom or not) is a must-have. If you don’t want a full-on hat, ear muffs or a headband are mandatory if you are in places like Ottawa or Montreal. Gloves/Mitts – we have “tech tip” gloves (mentioned above) which are great for using phones and generally having a usable hand. However, these are not warm enough if you are wandering a city at -15 Celsius or hiking/playing in the snow/skiing for a long period of time. For these activities, you will need thicker winter gloves. Scarf – a scarf is a good idea since it’s important to keep bundled up and keep your neck warm. Long Underwear – you might consider thinner, long underwear to wear under your pants if it’s cold enough. This goes for walking around Ottawa or hiking in Banff. Skiing Gear – same as with camping gear in the summer, if you are planning on skiing/snowboarding and you have your own great gear, then be sure to bring it along. That said, you can definitely buy or rent skis or other snow gear once you are here! And there you have it – some of our best Canada packing list tips for your Canadian adventure. We tried to cover all the seasons and give you a good idea of what you might need for your trip. In the end, every trip is different and everyone packs differently so look at this post as a guideline. Let us know how your trip goes and if there is anything we should include on this list for future travellers! We’d love to hear from you.